Boxing is one of the oldest sports in the world and requires a lot of respect and dedication. 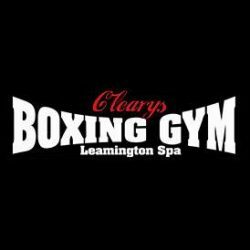 Cleary's Boxing Gym Leamington Spa opened its doors in 1st September 2007 and has since grown from strength to strength. In its first season alone members of the Amateur Gym have entered 44 contests and winning 40 of them. Whether you want to keep fit or become an amateur boxer Clearys Boxing Gym’s doors are open. We are affiliated to the Amateur Boxing Association and all our Coaches are fully CRB checked. For more information please do not hesitate to just call down for a chat. As a former amateur and professional boxer I have trained in many boxing gyms around the country and trained alongside some of the best boxers and trainers in the world. Along my way through the amateur and professional ranks of boxing I have learned many different styles and techniques, all of which I now pass on to the members of my gym. "I hated every moment of raining but i said, Don't quit. Suffer now and live the rest of your life a champion"
"You can't go out in the rain and avoid the rain drops you can't expect to box and not get hurt"
"If your in the gym every day, you have a chance"
"You never pull out in straight lines. Always give them angles"